Feel Good and Have More Fun! Yes, you can laugh (also, sometimes my hair actually goes like that in the morning!). 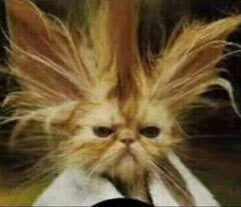 But the best way to end up feeling like this kitty, i.e. grumpy and non-amused, is not to have enough fun time, or chill out time, or time to give new things a try. So, once I’ve done the stuff I really do have to do (and made the best of it by enjoying it as much as possible!) I’m only going do things that make me go YAAAAAY!!! I’m going to do even more riding, and go to this dancing group where the music goes on and you just totally do your own thing from within yourself and be wild and free (I will probably give myself a black eye with my own knee somehow, me being me, but I’ll take the risk!). I’m also going to listen to more audio books in bed all cosy with my eyes shut, take toffees with me on long country walks as a treat halfway round, and do anything else I can think of to FEEL GOOD NOW in each moment. Because, of course, life is made up of all those little ‘nows’! So, FEEL GOOD NOW, girls! Now is the moment!